Beauty is something that is very important in today’s world. The more attractive, fun and youthful you are, the more you get all the attention. In fact, there are many flourishing professions like acting, cabin crew, etc. where you have to look pleasing and presentable all the time. Now, good looks are not always restricted to a good body or sharp facial features, your skin also play an important role in it. Most of us are blessed with good quality skin and if you are a bit aware, you will be able to maintain the beautiful and youthful skin forever. It’s not that difficult, especially when you are willing to be cautious and want to maintain the quality of your skin. Some of us are blessed with naturally good skin while some of us may have skin issues. However, there is nothing to feel disheartened about it as if you do not have good skin, you can definitely take care of it and make it attractive. For those who already have it, they can easily maintain the quality of their skin for longer. Whatever be the case, if you are concerned about maintaining the quality of your skin, then you can’t afford to miss this post. Today in this post, I am sharing with you the top 11 best hacks that will help you to maintain beautiful and youthful skin forever. These hacks are easy to apply and works magically. We all know that to have the youthful skin is a blessing but many a times we find that due to unhealthy food habits, pollutions, lack of proper skincare routine etc. the natural glow of the skin get lost. Your skin is exposed to innumerable toxins every day that leaves your skin dry, dull and lifeless. In fact, these are also the leading causes of pimple breakouts, blackheads, whiteheads and several other skin problems. However, what is more disappointing to note is that, most youngsters in the greed of getting quick benefits end up spending lot in costly makeup & cosmetic products or go for expensive skincare techniques. I mean it is OK, but most of the time, little boys and girls use products that may not be right for their skin and end up damaging their skin more. But, what they completely miss out or ignore is to try out the natural ways to maintain beautiful and youthful skin quality. If you just look around your kitchen, you will find several natural ingredients that you use in your daily life but you have never thought of using them for skin benefits. But not to worry, I will help you with this and let you know how to use these natural kitchen ingredients to maintain beautiful and youthful skin. I will be discussing in details about the natural ways to maintain beautiful and youthful skin, but before that, let me tell you about a few of things that may damage your skin. Knowing the cause will certainly help you maintain the quality and youthfulness of your skin. The reason I thought of discussing the factors that may damage your skin is that, many a times we ourselves carry on certain lifestyle habits that are self-damaging. These lifestyle habits can hamper your glowing skin without you even knowing it. Although there are many unavoidable factors as well, most of the harm we cause to our skinisself-inflicted. So, it is important to know the causes so that you may try to restrict things as much as possible. Certain diseases and old age. There can be several factors but the factors listed above are the most common factors causing skin damages. Now, I will talk about the natural ways to maintain beautiful and youthful skin easily. Some of which, you must have understood by now, but I will talk about each of them in details so, keep reading the post to know more. Everyone has the right to look gorgeous and the quality of the skin plays a significant role in it. While some struggle to improve their skin quality, others fear losing their naturally blessed skin. All thanks to the various unavoidable environmental factors and the other unhealthy lifestyle practices that most of us do. But, what’s interesting is that there are few natural easy techniques following which, you will be able to remain gorgeous forever. Well, yes, and below I have mentioned 11 coolest ways to maintain beautiful and youthful skin forever. Take a look and then try these out for amazing results. Whatever you eat plays an important role is not just your health but also on your skin. The unhealthier you eat, the duller your skin will get. So, it is very important that you maintain a proper balanced diet for your skin to get all the necessary nutrients that it requires. By proper balanced diet, I mean you have to eat variety of food items. In other words, you just cannot concentrate on items that you love and completely ignore the other ones. It is best if you can follow the diet rules to stay fit and maintain the healthy glow on your skin. You have to make efforts to cut on the excess sugar intake and instead include the healthy fats, proteins and other nutrients. Fruits and vegetables of all shapes, sizes and colours must be included in the diet chart. Not just the consumption of healthy ingredients, but also a proper diet schedule is important. 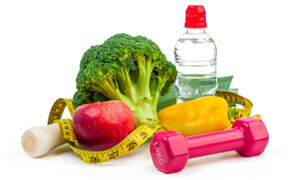 By diet schedule I mean to say a proper routine of when to eat, what to eat and in what quantity to eat. This is also an important diet rule and is also one of the best natural ways to maintain beautiful and youthful skin. It is good if you can maintain your meal timings. Try to eat frequently but in less amounts. Your way of eating also matters and so it is important that you do not eat in hurry. Chew your foods properly and eat slowly. This will help in proper digestion and as well as help your body absorb the nutrients better that in turn will improve your skin quality. Be it maintaining a good physique to imparting a healthy glow to your skin, water has no alternative and is the basis of healthy living. Therefore, needless to say, you have to drink plenty of water and this definitely is one of the best natural ways to maintain beautiful and youthful skin. Water cleanses your system by flushing out the harmful toxins from body, whose accumulation not just causes diseases but also hampers your skin. Your body needs to be purified and that is what water does. So, drink minimum 4-5 litres of water daily and stay hydrated and let your skin breathe. You can also try out the detox water recipes that will give an interesting twist to the taste of water as well make it healthier. Once you are done with healthy eating, it is time for proper skin care. Today’s generation is quite impatient and most of them want quick overnight results. This is the main reason why youngsters opt for costly market products or go for facials and other expensive skin treatments. While hitting the salon is good but it is not an affordable option for all. And, as far as the market products are concerned, most of them contain harmful chemicals that may damage your skin instead of improving it. What is even more harmful is that most of us use these products blindly without even knowing whether they suit our skin type or not. Each one of us have a unique skin type and skincare must be done keeping that in mind. In other words, what may suit me, may not suit you. So, first know your skin type and then use products based on it. Proper cleaning, toning and moisturizing are the basics of skin care. But it is best to go the natural way when it comes to skincare. There are several natural ingredients like honey, lemon, cucumber, yogurt, Aloe vera, sandalwood etc, which if used in proper way can gift you with wonderful skin. Home remedies are very easy and going the natural way is definitely the best way to maintain beautiful and youthful skin. We have already published number of posts on natural home remedies for your skin starting from those for oily skin, dry skin, etc, which you can refer for details. Also, skin care depends on the season like there are separate skin care methods for winter, monsoon etc.So, basically skincare is not just anything but it is actually something which you must do dedicatedly to get magnificent results. See, if you are making efforts to follow a good skincare routine but end up using harsh makeup products, then all your efforts will go in vain. Although it is best to put minimal makeup and let your skin glow naturally, but if you still love makeup then please use the trusted brands only. Mostly for people with sensitive skin, the usage of cheap harsh products may be dangerous, so please be careful before using them. Besides that, proper removal of makeup is equally important. Never go to sleep with your makeup on your face. This is really bad and may damage your skin texture and also lead to severe breakouts. Several studies have shown how lack of proper sleep can affect your skin immensely. Lack of proper rest will make you tired, irritated and ill that in turn will affect the quality of the skin. Your skin will slowly develop dark circles, wrinkles on it and lose its natural lustre in the end. While babies need long hours of sleep, an average adult requires minimum 7-8 hours of proper sleep. Sleep will rejuvenate you and uplift your mood and the happier you are, the more will your skin glow. However, due to several factors we, today suffer from insomnia which has affected our health and beauty a lot but if you are determined to set things right then you should learn to sleep like a baby. These are one of the unavoidable factors which damage your skin but if you are a little careful, you can protect your skin. For those, who stay indoors most of the time, these factors may not be that problematic but for major section of the busy men and women, the sun and the harsh weather outside are definitely enemies of your skin. Since, it is not possible to stop going outside, you can at least take protection when you are out. Before leaving your home, you may apply a good sunscreen few minutes before your time of leaving. This will protect your skin from the harsh rays. However, the problem of sunscreen is it washes away once you start sweating and so you must also carry an umbrella with you to lessen the sun exposure. You may also wear soothing light and mild coloured full sleeve tops and full pants so that your hands and legs are protected from direct exposure to the harmful sun rays. This will reduce skin tan and help you maintain the healthy glowing skin. And, to protect your skin from the dust and pollution or the harsh wind outside, you can easily wrap a scarf around your face. This will give protection to your skin as well as save you from the heat outside. Most of the skin damage occurs due the unhealthy habits that we have. Until and less you know how to lead an organized and disciplined life, you never can get a flawless skin. While there can be lot of unhealthy practices, I here want to focus on your excessive smoking and alcohol consumption habits. Excessive smoking and drinking can make your skin tone dark, saggy and dull. It takes away the youthful glow from your skin and makes you look older than your actual age. So, if you do not want that then quit smoking and reduce your alcohol consumption from today onwards. In fact, both of these are extremely dangerous not just for your skin but for your overall health as well. Both are very much instrumental in increasing the risk of getting affected by the life-threatening cancer. So, why put yourself at risk and instead remain healthy and beautiful by quitting such unhealthy practices. Stress and anxiety are the leading causes behind skin damage and combating them is one of the best natural ways to maintain beautiful and youthful skin forever. However, it is a known fact that if you are happy from within, it is bound to reflect on your face. You will automatically glow and look fresh. But, unfortunately life is not that easy and simple as it was before, so we are bogged down with tension and worries which reflects on our skin. Thankfully, there are ways to combat it which may not be that easy but are definitely not impossible. You can try out various relaxation techniques and most importantly practice meditation. This will help you keep your mind at peace and relieve you of the stress. Also, remember that those who suffer silently are the worst victims. If you can share your worries with your trusted ones, you will feel better and if you are too much of a private person and do not want to talk openly about your worries, then at least pen down your thoughts using a pen and a paper. This is a venting out method that in many cases works. You may try any of these to fight your depression and if you are successful in it, your skin will look beautiful and gorgeous forever. Fit body and a healthy mind are instrumental in making your skin glow. So, once you are done with putting your mind at peace, it is time for some exercises. Daily work outs are important and it not just helps you maintain a good body but also gives a healthy glow to your skin. Proper exercise increases the circulation of nutrients and oxygen in body as well as flushes out the harmful toxins from the body in the means of sweat. So, this leaves your skin smoother and clearer from within. However, the best exercise to maintain beautiful and youthful skin is to smile and you must never forget to do that. While you cannot control the outside pollution, you can definitely keep your living environment clean. Cleanliness is very important not just for your health but also for your skin. At times, it is seen that the indoor pollution is greater than the outdoor, so it is better to plant more trees in your garden and grow some of them in small tubs inside your home. This will refresh the air inside and keep it clean. Also, as far as cleanliness is concerned, you have to wear good quality clean clothes and avoid cheap fabric that can irritate and damage your skin. The pillowcase, bed sheets everything needs to be clean and dusted properly before you use them. The dust can hinder your skin quality and so try to keep your surroundings clean. 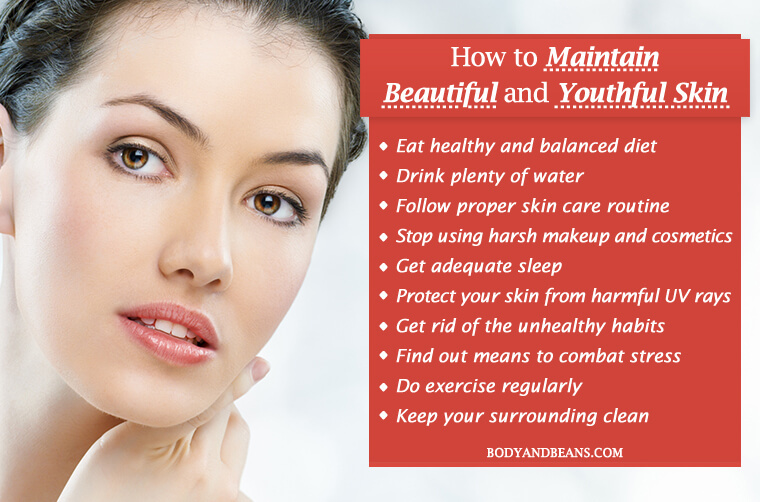 How do you maintain your beautiful and youthful skin? Beautiful skin adds to the general beauty and having naturally glowing skin is a blessing. But since various factors like pollution, stress, lack of proper skin care, diseases, etc degrades its quality, you must take special efforts to maintain it. Now, efforts do not mean that you have to spend bucks in maintenance. Sometimes, being natural is the best method and indeed there are several natural ways to maintain beautiful and youthful skin. All you need is a little patience and diligence on your part to get what you desire. Natural methods always give permanent or long-term benefits but sometimes the process is slow. You cannot expect overall glowing skin. You have to wait and keep yourself at peace to make you naturally glow from within. Eating healthy definitely works as your skin requires healthy foods and nutrients to look healthy. Side by side you have to drink plenty of water to purify your system, get rid of the unhealthy practices like excessive smoking and drinking and also maintain good and proper skincare routine to keep your skin healthy and glowing. Stress is a major factor behind dull skin and you must try out meditation and other relaxation techniques to combat eat. Sleep well and maintain a proper timing of going to sleep and getting up. And as far as the outside pollution and ultraviolet sunrays are concerned, try to keep yourself protected and covered whenever you are going out. All the natural ways to maintain beautiful and youthful skin that I have mentioned above are very effective and does not require much of the efforts on your part. These are basically activities that you must do for your general wellbeing. And, smile as I said is the best remedy for everything. Just smile and let your skin reciprocate it. Once it does, you can enjoy beautiful, glowing skin forever as no other remedy can make your skin glow until and unless you are happy from within. Do you love your skin? Are you wondering how to maintain it? Well, then have you checked out my natural ways to maintain beautiful and youthful skin? These ways are simply cool and works for me. You can try these out and let your skin naturally breathe and glow. You can also share your personal experiences and suggest other natural ways to maintain beautiful and youthful skin. I will be happy to include those in my list. Until then, stay happy and never let that glow disappear from your skin.